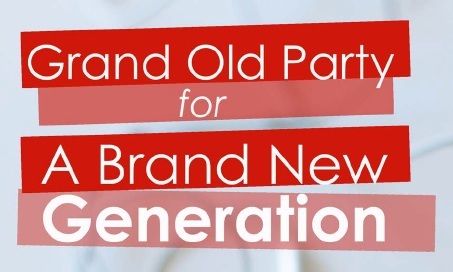 A very interesting report, “Grand Old Party of a Brand New Generation,” was recently released by the College Republicans showing what Americans born since 1980 think of the Republican brand. “The most enlightened sentence of the report seems to be buried and ignored by its authors: “It is not that young voters are enamored of the Democratic Party. They simply dislike the Republican Party more.” Instead of delving into they pursued various tangents. Though I think they’re correct in saying the the GOP has a better position with future leaders than the Democrats (which reflects more perspectives within the party compared to the Democrats), they can’t see the forest through the trees. I’d expect them to examine why young voters went in droves for Ron Paul during the primaries, or notice the growth of libertarian campus groups, or compare their promises to their actions, but I couldn’t find a sentence of it. After eight years of Republicans expanding government at a pace not seen since Johnson, undeclared and unending wars, the horrifying erosion of civil liberties, immigration restrictions, and an economic contraction, as the GOP continuously talked of limited government and American liberty, why would anyone trust the GOP over Obama? Harry Browne noted that “Republicans will continue to campaign like Libertarians while governing like Democrats;” they’ve done it for 30 years and, aside from Ron Paul, few Republican leaders lived an exemplary personal or political life after Goldwater. Much better, then, to hope the Democrats gain power and erode economic and personal freedom at a slower rate than Republicans (and, maybe, Republicans would act like obstructionists), though that theory didn’t predict reality. Would the past four years (or the next four) have been better with McCain or Romney, though? It’s doubtful. I think Tony’s assessment is spot on. What is the Republican Party offering the next generation of voters in terms of promises kept, actual results or differentiation from Democrats? And when it comes to fighting policy battles right now, well….many of you have probably heard me beat to death the importance of messaging. Conservatives and liberty minded people in general need to pick and choose battles that can best be framed through the lens of freedom and fairness. Republican politicians are abandoning good ideas and embracing big government concepts, without ever fighting the battle. Freedom is popular. This is the key to everything. Make every battle a defense of personal and economic freedom, and liberty minded people can win any war. As an example, this is why the Ohio Workplace Freedom Amendment (ending forced union dues) blows away SB5 (Ohio’s disastrous collective bargaining fight in 2011) in every poll. By ending forced union dues with Workplace Freedom, we are restoring rights and providing greater freedom and choice to each Ohioan, not taking anything away. Huge difference! It’s just incredible that Republicans are having a problem selling the American Dream. Think about this. The story of America is one the greatest stories in world history, and has brought unprecedented prosperity to millions of people through advancements in healthcare, food production and technology the likes of which the world has never seen. They are having a problem selling this story? Wow. Liberty minded people have everything we need to win these battles. We have emotional ammunition, solid messaging and facts to make our appeal more credible. But quite simply – this is not being done. I’m not a party guy. Never have been. I tell people all the time, I’m libertarian by philosophy and independent by political affiliation. I vote for candidates with this idea in mind: will this person increase the size, scope and influence of government or not? This means that I’m not here to do image consultation for the Republican Party. But, I am a political geek at heart, and can’t help but see the lumbering dinosaur that has become the Republican brand. It has sustained so many self-inflicted wounds, it’s close to death. My advice to the Republican Party is to start framing your positions from a freedom-friendly perspective, and yes – that means consistency in these areas from a policy perspective as well. You can only passionately defend what you truly believe and actually vote for it when the time comes. This awkward moment is all too frequent in the media – Republicans stand before the camera and can’t deliver a speech or answer questions in a credible way, because they aren’t even sure what they believe. It’s amazing how powerfully sincerity is conveyed to people. Merge honest conviction with great messaging and a record that reflects the same, and you’ve found gold. Freedom is most definitely the answer. I’m just not sure the Republican brand stands for freedom anymore. Time will tell. PS: Thanks and good luck to Rand Paul, Mike Lee, Ted Cruz, Justin Amash and Thomas Massie on this journey through a freedom-centered political career. Definitely an uphill battle.